I was digging around Pinterest one night and saw this. It looked positively DELISH and after a visit to TastingTable.com’s Hot Diggity post, it got me thinking about a venison dish. Last year I shared a recipe for a burgundy style deer heart inspired by french cuisine. It has been a while since I have posted a recipe, but because of the pin I was excited to continue my mulie meat world tour and take a culinary voyage to Korea for some kimchi fried rice. 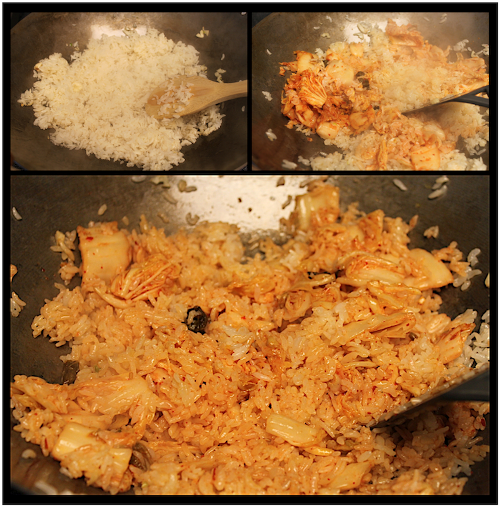 Kimchi fried rice or kimchi bokkeumbap is a popular dish in South Korea. It combines all the yummy goodness of fried rice with spicy fermented cabbage (kimchi). I love kimchi and those who have dined with me in korean restaurants know I can put away a serious amount of the stuff. I think I could even make a meal of it. I love it so much that earlier in the year I bought some NOH Kim Chee packets with every intention of making my own kimchi. But, I digress. Back to the venison version! 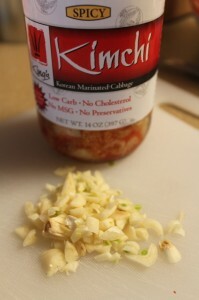 In a large bowl combine the kimchi spice packet with 2 cups water and stir to fully combine. Cut away any grizzle from the steaks and submerge in the kimchi marinade. Soak for at least 4 hours. Prepare and cook three cups of white rice. Begin plating in either shallow bowls or plates. Disperse 1 handful of spinach into each dish. Divide the avocado slices among each serving, placing along the edge on top of the spinach. Heat a wok on high heat. Add the sesame oil and let it get hot so that it ripples. Swirl the wok to coat the bottom and sides. Add the chopped garlic, stir and cook for about 15 seconds. Add the rice and stir so that all is coated with the oil. Spread the rice out along the base of the wok and let cook so that it browns before stirring again. Add the prepared kimchi and combine. Use a spoon or spatula to break up any large pieces of the cabbage. Place a large scoop of the kimchi rice in the center of the bed of spinach in each dish. Cover to keep warm. Heat a grill pan on high heat. Prepare an additional skillet on medium low heat to cook the four eggs. Add the olive oil to the skillet. Once the grill pan is searing hot, place the marinated steaks on the pan. Sear 1 inch thick steaks on both sides for 1.5 to 2 minutes for medium rare to medium doneness. Thinner steaks will cook faster. For thicker steaks add time accordingly. Add all four eggs to the skillet and once the whites have set, flip with a spatula and remove from heat. Distribute the steak into the serving dishes on top of the rice and top each steak with an egg.